What’s the best way to waterproof bathroom floors without adding too much height? There are many options but we recently used Hydro Ban since it’s easy to apply. Seriously, only a paint brush and roller are needed. But there’s one step some folks forget. Let’s dive in and share those tips! 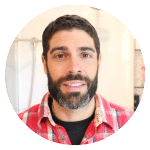 There are so many products to use during a bathroom remodel. It’s downright confusing. Using the right materials is super important. Hydro Ban has been around for years and one of the best options for waterproofing bathroom floors. Heck, Hydro Ban is so solid they actually make Hydro Ban Boards for shower walls. Btw, if you’re looking for where to get Hydro Ban or any Laticrete products, click here to find a local distributor. Waterproofing the floor without adding additional height to the tile. This bathroom was self-leveled, which unfortunately made a small step at the entryway. That ruled out isolation membranes that typically add 1/8″ of height. Hydro Ban on the other hand is less than 1/8″ thick after two coats. What’s a wet film gauge? It’s safe to tile directly over Hydro Ban once it cures. And we’ll have some tips on that soon. 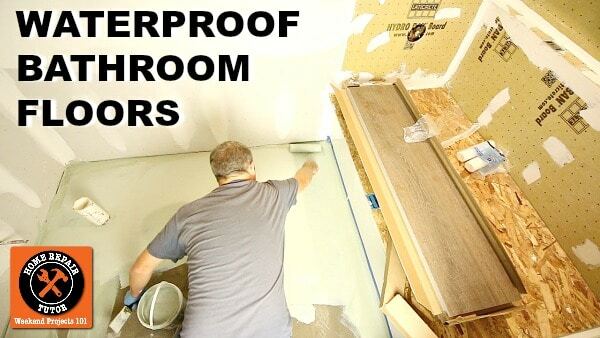 This tutorial is part of our video series on how to remodel basement bathrooms. The prior step was installing an acrylic Kohler bathtub. Thanks John, you’d like Hydro Ban. Great option for bathroom floors and cement board if you use that for the shower walls. Hi Jeff, Great video never heard of Hydro Ban.Very good information so I’m signing up so you can keep me posted on the course. Not that I’m going to do a bathroom remodel but you never know what the future will bring. Thanks Dianne, hopefully some of the tips come in handy down the road. hydroban or redguard for the bottom layer of a pored shower pan? thanks!